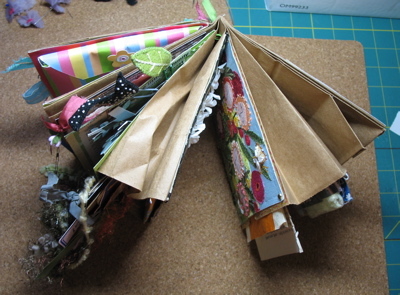 I’ve got Month 4 done of my paper bag swag project. You might be thinking that you haven’t seen one of these for a while- well, you are right. We had a one month “vacation”… ahem. Well, Amy and Ellia had good excuses. For the rest of us, not so much. It was just life, taxes, school, kids, travel, etc. Anyway, hopefully we are back on track. Theresa will keep us in line! Two more pages/months to go . I was working on Cathy’s book this month. Her theme is inspiration, but I’ve got to tell you something- I just did what I felt like doing and then thought about how I could fit it into the theme… that is a real art confession. Of course, personal history and nature, very inspiring! I put a few more detail photos on Flickr-here, here and here. And a side view. I’m going to have to find a big box for this! Kristen, it’s going in the mail today! 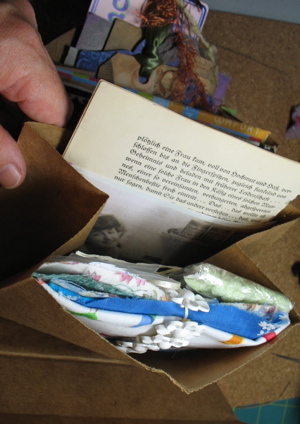 This entry was posted in finished projects, General, paperbag swag book by mimik. Bookmark the permalink. Love it all must go and check out flickr. ladies basking in the sun. er… thats what comes to mind, nice. Love those flowers and that garden! The flower face page is just enchanting. 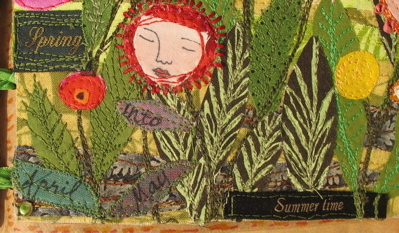 I love the colors and the textures and how you have put it all together. Mimi, these are just beautiful! 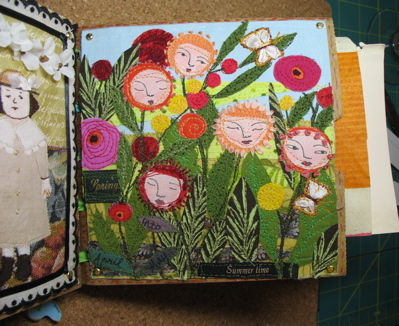 I really like the pattern and texture of the flowery scene. Superb. Those flowers are so amazing, so beautiful and full of life. Oh wow love your bag swag beautiful! One can rarely catch the beauty of nature in camera accurately. But I can imagine how beautiful it must be. May I ask Mimi, what do you use to draw the face features on your baby postcards, etc.? Thanks. 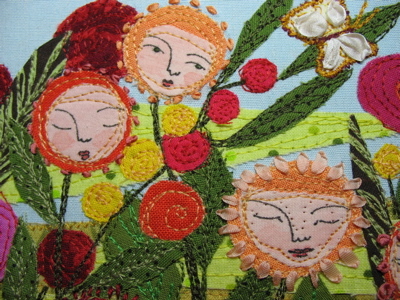 I love the flower “ladies” too – each face shows its own personality! ah ha!! 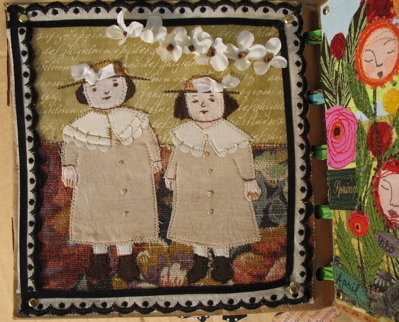 sepia toned fabric…it makes so much sense why that fabric collage of the girls works so well. guess it should be obvious, but maybe my brain is on over-load…and you already know how i feel about the flowers page….didn’t really think it could be any better, then to hold it in my hands? sigh. it’s great mimi. I absolutely love these flowers! wish you sold them they are really sweet! Keep up the wonderful work! I bought ””boyfriend” last weekend in Boston. I love him and he is very quiet, perhaps waiting to see what kind of woman I really am. I joined and uploaded photos to flickr tonight just as you suggested. 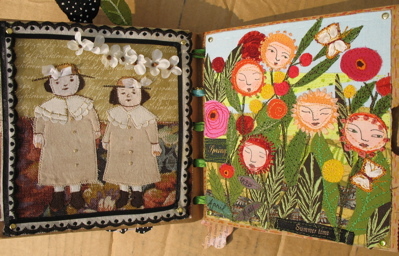 It was easy kindof and I look forward to more development of my work, quilts and dolls….. my blog with photos of my dolls is http://www.fabricinthewind.blogspot.com. I really admire your wonderful work.